Welcome! My name's Lindsay. I'm a spiritual intuitive, empath and Reiki practitioner. Armed with intuition and a desire to help others grow, I write the articles on The Daily Awe to do just that. I offer intuitive readings, manifesting expertise and energy healing to those near and far. I'd love to work with you! Whether you're looking for a New Moon intentions worksheet, guidance for easy manifesting or downloadable, personalized meditations - you'll find it here in The Daily Awe shop. Stay tuned for reiki-infused products coming soon! I'm a Certified Reiki Practitioner and Master/Teacher in Toronto. My specialties include: reiki for infants and small children, reiki for those at end-of-life and reiki for those with physical pain and/or anxiety. For over a decade, I've been on a journey of developing (and following!) my intuition, writing helpful resources for fellow empaths and intuitives and spiritual seekers. You'll find some of my favourite (and most popular!) articles here. 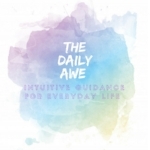 Subscribe to The Daily Awe on YouTube for more spirituality & intuition-related videos! If you like what read on The Daily Awe or you've found any comfort or inspiration in these words, please consider making a small contribution. Your support helps keep the site (and me!) running.